Facebook is world largest community and it's only aim is to make world more open and peoples more connected. No doubt about the dream of Mark and many engineers to complete their aim in future. The main part to explore everything is only by making searches . We search friends, peoples, places, pages, groups and much more things. But simple search is limited. So to remove search limitation, mark zuckerberg's ask search team to design and built new search system which search the entire social graph. So this is very interesting and difficult task because it is totally different from traditional keyword based search engines. Few days back, many engineers announced about adding new feature of Facebook Graph Search. It is more exited part for me also because its really make people more connected. I also read many articles about Graph search on my social media sites. Then i decided to make new article about Graph Search and its features. 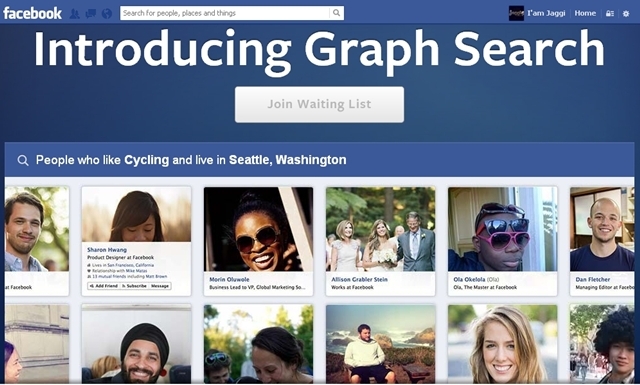 What Is Facebook Graph Search ? As Facebook search team do hard work from few year to design Graph search. Do you ever here about graph search ? Possibly it's answer is no. Graph search is currently in beta testing version. It is available for very few Facebook members. Hope it becomes available after some days. Is their any different between Graph Search and web search ? Absolutely, Yes Graph search is totally different from simple web search because web search is totally based on Keywords. Web search show possible results related to keyword which you search. But Graph show you results which are totally different, it show result for keywords which related with people, places, pages, photos and interests. Result for People :- Peoples from my hometown, People from my city who like pizza, People from Amritsar who like singing, Friend from new york who are now at Golden Temple, Software Engineers from my city and much more search like this. Results for photos :- Photos of my friends of school time, Photos of my wedding, Photo of my family before 2005, Photos of my friends with Actors, Photos of Mark in India much more photos something like that. Results for Places :- Restaurants in London, Theaters nearby Amritsar, People from UK now in India, Friends from Italy now in Australia. Attractive Places of China. Popular city visited by friends, doctor like by my friends and much more. Results for interests :- Friends who love eating mangoes, Friends who like my childhood videos, people who have interest in playing carom. Friends who have interest in watching TV and much more. I hope these examples and whole article helps you to understand more about graph search and its working. At Present time graph search is in a beta testing version. I hope its become available publicly with in few days or months. But on Beta testing version luckily i got invitation from Facebook team on my account to join the waiting list of graph search. I hope you also got, it is currently available only in Us English version. At the end i hope you find this article useful to explore more the features of Graph search. If you find this article helpful must share with your friends are also ask them to join waiting list of graph search. yοuгѕ. It is prеttу ρrice sufficient for mе.